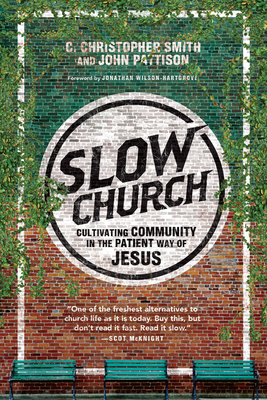 2014 Readers' Choice Award Winner2014 Best Books About the Church from Byron Borger, Hearts and Minds Bookstore Fast food. Fast cars. Fast and furious. Fast forward. Fast . . . church? The church is often idealized (or demonized) as the last bastion of a bygone era, dragging our feet as we're pulled into new moralities and new spiritualities. We guard our doctrine and our piety with great vigilance. But we often fail to notice how quickly we're capitulating, in the structures and practices of our churches, to a culture of unreflective speed, dehumanizing efficiency and dis-integrating isolationism. In the beginning, the church ate together, traveled together and shared in all facets of life. Centered as they were on Jesus, these seemingly mundane activities took on their own significance in the mission of God. InSlow Church, Chris Smith and John Pattison invite us to leave franchise faith behind and enter into the ecology, economy and ethics of the kingdom of God, where people know each other well and love one another as Christ loved the church.